Natalie Goldberg teaches people to fall in love with their life. She is an author, poet, teacher, and painter, for whom the writing and spiritual lives are interconnected. She has written fourteen books, including Writing Down the Bones: Freeing the Writer Within (1986), which broke open the world of creativity and started a revolution in the way we practice writing in this country. The book has sold over a million and a half copies and has been translated into fourteen languages. In the sequel book, Wild Mind, Goldberg continues to teach her method of writing by taking the writer beyond craft to the true source of creative power: the wild mind that is “raw, full of energy, alive and hungry.” In Thunder and Lighting, Goldberg takes us on to the next step in the writing process: turning our flashes of inspiration—”the thunder and lightning of creation”—into a polished piece of work. In The True Secret of Writing: Connecting Life with Language (2013), Goldberg provides a fresh new insight into writing accessible to all readers and in her most recent book The Great Spring: Writing, Zen, and This Zigzag Life, Goldberg shares vivid moments that have awakened her to new ways of being. As a memoirist, Goldberg takes us into her study and practice of Zen Buddhism. In Long Quiet Highway: Waking Up in America, she captures both the moments of illumination and the long discipline of daily practice, the hilarity of error and the grief of our resistance to change. She is also the author of The Great Failure: My Unexpected Path to Truth and her most recent the memoir Let the Whole Thundering World Come Home (2018), a clear-looking memoir on being in love with your life even when life brings illness..
Goldberg has been teaching seminars in writing as a practice for the last thirty years. People from around the world attend her life-changing workshops, and she has a reputation as a great teacher. The Oprah Winfrey Show sent a film crew to spend the day with Natalie for a segment on spirituality that covered her writing, teaching, painting, and walking meditation. Her lively paintings can be viewed at the Ernesto Mayans gallery on Canyon Road in Santa Fe. She currently lives in northern New Mexico. Natalie Goldberg is the author of fourteen books, including Writing Down the Bones: Freeing the Writer Within, which has sold over a million and a half copies and been translated into fourteen languages. Her latest book is Let the Whole Thundering World Come Home. She is also the author of The Great Spring; Banana Rose; Living Color: A Writer Paints Her World; and Top of My Lungs, containing forty poems, twenty of her paintings in color, and an essay, “How Poetry Saved My Life.” With the filmmaker Mary Feidt, she completed the documentary Tangled Up In Bob, about Bob Dylan’s childhood on the Iron Range in northern Minnesota. 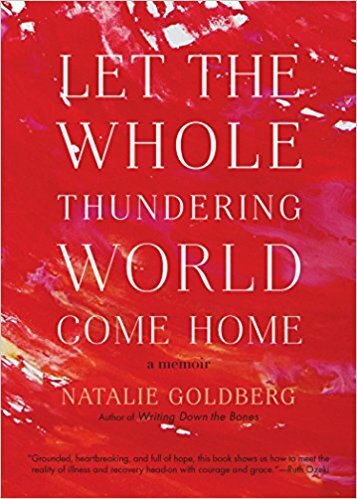 A moving and clear-looking memoir on being in love with your life even when life brings illness, from longtime Zen practitioner and world-renowned writing teacher Natalie Goldberg. When Natalie learns that she has CLL, a potentially fatal form of blood cancer, she is plunged into the world of hospitals, doctors, and medication. While trying to find a footing in this new and strange world, her partner, Yu-kwan, is also diagnosed with cancer. The cancer twins, as Natalie calls herself and Yu-kwan, must each navigate their own illness while somehow trying to stay in love and heal. “When you go through extreme sickness, when everything you know and lived is tossed out the window and glass shatters . . . this too is part of life. Don’t give up. Pay attention. We have to make ourselves larger to include the inconceivable.” Through a direct and grounded narrative, Natalie illuminates a path through illness: that we need to be in love with the life we have, to embrace the dark and the light in our life. For Natalie, writing and painting represent the light, and her cancer takes her deeper into her art practices. Balanced with a Zen practice that helps her to face death, this book is a moving meditation on living life in full bloom. From beloved writing teacher and author of the best-selling Writing Down the Bones: a treasury of personal stories reflecting a life filled with journeys—inner and outer—zigzagging around the world and home again. Here, Natalie Goldberg, “a writer both energized and enlightened” (Julia Cameron), shares those vivid moments that have wakened her to new ways of being. We follow alongside her mapless meanderings in the New Mexican desert and her pilgrimages to Bob Dylan’s birthplace and to Larry McMurtry’s dusty Texas ghost town of rare books. We feel her deep hunger while she sits zazen in a monastery in Japan, and her profound loss when she hears of the passing of a dear friend while teaching in the French countryside. Through it all, she remains grounded in a life informed by two constants: the practices of writing and of Zen. With humor and insight, Natalie encircles around the essential questions these paths compel her toward: Where does this life lead? Who are we? This is a book to be relished one awakening at a time. Each story is a reminder that no matter how hard the situation or desolate you may feel, spring will come again, breaking through a cold winter, bringing early yellow forsythia flowers. And the Great Spring of enlightenment—that sudden rush of acceptance, pain cracking open, obstructions shattering—will also burst forth. Sit. Walk. Write. These are the barest bones of Natalie Goldberg’s revolutionary writing and life practice, which she presents here in book form for the first time. A whole new slant on writing that she developed since the publication of her classic Writing Down the Bones. True Secret workshops have been limited until now to small, intensive groups at a remote center in the rural Southwest. In The True Secret of Writing, Goldberg makes this popular seminar available to any reader. When I teach a beginning class, it is good. I have to come back to a beginner’s mind, the first way I thought and felt about writing. In a sense, that beginner’s mind is what we must come back to every time we sit down and write. There is no security, no assurance that because we wrote something good two months ago, we will do it again. Actually, every time we begin, we wonder how we ever did it before. Each time is a new journey with no maps. So when I teach a writing group, I have to tell the story all over again and remember that the students are hearing it for the first time. I must begin at the very beginning. I never paid much attention to Gauguin’s muscles. And his kisses? They weren’t all that memorable, though sure, I liked kissing him. It had more to do with water. The first time I saw him, even before I spoke to him, I felt it. Then, over the course of our relationship, I felt all kinds of water: a slow river, shallow and muddy, like the Green River flowing through the red canyonlands in Utah; the hard sparkle of water in a creek after the snow has melted and it catches the sun or even the moon’s cold light; also the kind of water that would come out of the faucet in my family’s place in Brooklyn. I’d stand in the kitchen, leaning on the sink, waiting for the water from the spout to run clear, and then I’d fill a tall drinking glass with it. As I drank, I’d smell fresh green parsley sprigs. All of this about water woke in me when I first laid my eyes on Gauguin.